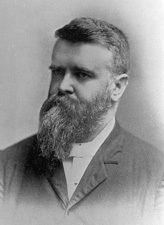 WHITE, Stephen Mallory, a Senator from California; born in San Francisco, Calif., January 19, 1853; moved with his parents to Santa Cruz County, Calif.; attended private and common schools and St. Ignatius College in San Francisco; graduated from Santa Clara College, Santa Clara, Calif., in 1871; studied law; admitted to the bar in 1874 and commenced practice in Los Angeles, Calif.; district attorney of Los Angeles County 1883-1884; member, State senate 1887-1891, serving as president pro tempore both sessions; was an unsuccessful candidate for election to the United States Senate in 1890; elected as a Democrat to the United States Senate and served from March 4, 1893, to March 3, 1899; did not seek reelection; chairman, Committee on Irrigation and Reclamation of Arid Lands (Fifty-third through Fifty-fifth Congresses); died in Los Angeles, Calif., February 21, 1901; interment in Calvary Cemetery. American National Biography; Dictionary of American Biography; Dobie, Edith. The Political Career of Stephen Mallory White: A Study of Party Politics Under the Convention System. 1927. Reprint. New York: AMS Press, 1971; Grassman, Curtis. Prologue to Progressivism: Senator Stephen M. White and the California Reform Impulse, 1875-1905. Ph.D. dissertation, University of California, Los Angeles, 1970.